With 40 seconds remaining in Wednesday night's D1 state semifinal at Worcester's DCU Center, Western Mass champ Springfield Central held an eight-point advantage over Central Mass champion Franklin, and appeared ready to play for a state championship in its home town. Those thoughts were all dashed, seemingly in an instant, as Franklin freshman Chris Edgehill went on a one-man 8-0 run to force overtime, where the Panthers would ultimately prevail 60-54. But there was much more to it than that, because the waning moments of regulation produced one of the craziest sequences you will ever see on a basketball court. Down eight, Edgehill buried a three to pull the Panthers within five. A careless Springfield Central turnover gave Franklin the ball, and the Golden Eagles fouled Edgehill before the Panthers even inbounded for their next possession. 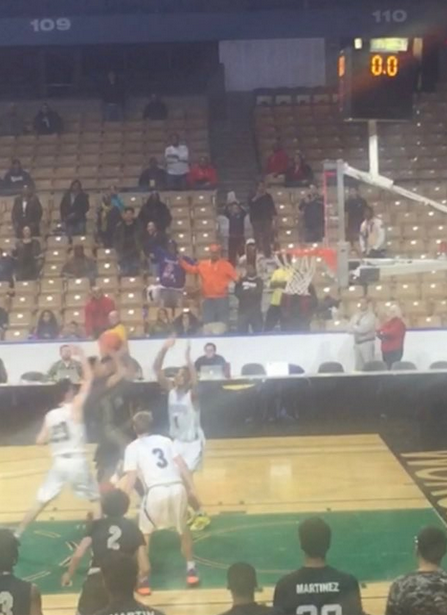 Edgehill hit both shots at the line, then Springfield Central threw a pass out of bounds to give Franklin one last chance, down three, with eight seconds to go. Again, the Panthers turned to their star freshman. "(Edgehill) is always ready to play," Franklin coach C.J. Neely said. "He woke up with a fever yesterday, and he said, 'don't worry, I'll be good,' and he always seems to make big plays in big moments." With a hand in his face, Edgehill knocked down a corner three, but Springfield Central rushed the ball down the court, and senior Jashidi Pressley nailed a runner in the lane to apparently give Central a buzzer-beating win. After the Golden Eagles rushed the court and dog piled on top of Pressley, the referees huddled and ruled that the shot was after the final buzzer, sending the game to overtime tied at 51. This photo from Twitter user @jeff_ambrosini would show that the refs did, in fact, get the call right. "This game isn't over," Edgehill said of his team's mentality in the final minute of regulation. "Hell of a game. Probably one of the best games I've ever played in." In the extra period, Franklin claimed a one-point lead after sophomore Jalen Samuels buried a contested three, then extended its lead on a Connor Peterson putback. Springfield Central's Hason Ward pulled his team back within two at 56-54 Franklin, but the Golden Eagles were forced to foul, and four straight free throws from Paul Mahon and Peterson put the game on ice. "Once we rebounded and started forcing some bad shots, we knew overtime was ours," Edgehill added. Before the madness that ensued to end the game, Springfield Central built a lead around the hot shooting of Maickel De Jesus Garcia (18 points) and Justin Feleciano (16 points). The Golden Eagles also played great defense, as Ward and junior Jorge Torres combined for 9 blocks. But every time it seemed like Springfield Central was pulling away, Franklin answered. 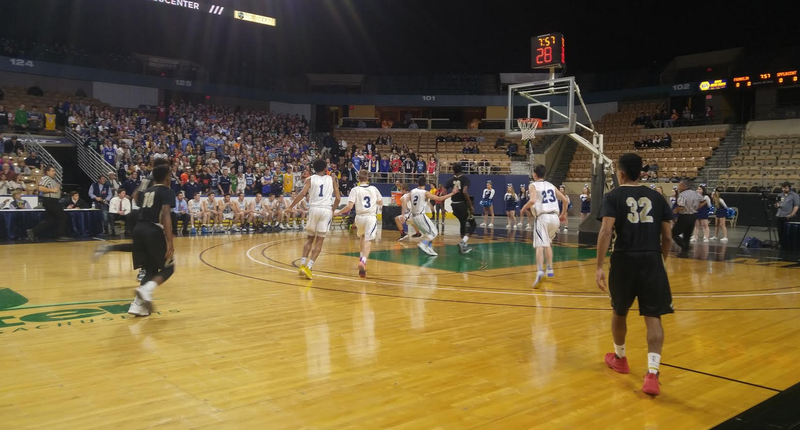 Whether it was Edgehill's heroics at the end of regulation, Peterson's elevated play in overtime, or Paul Mahon's combination of shooting and perimeter defense, the Panthers got contributions from seemingly everyone on the floor. Mahon, who had been out for the rest of the tournament with a head injury, was cleared to play earlier this week, while senior Josh Macchi also came up with some timely defensive plays and shots. "I actually channeled my inner-Julian Edelman (at the end of regulation)," Neely said. "I said 'it's gonna be a hell of a story,' and we just kept saying that at every timeout. 'It's gonna be a hell of a story, it's gonna be a hell of a story.'" "It's a once-in-a-lifetime opportunity right there," Edgehill said. "That's crazy. That's a hell of a story right there. Franklin basketball. Watch out." As great a story as it was for Franklin, it was just as much a heartbreaking loss for Springfield Central. The Golden Eagles came up just short of playing for a state championship in their home town, and had numerous chances to put the game away. Still, SC's coach insists his team will come back stronger and hungrier next season. "All I can tell you is, I feel sorry for (the teams we play) next season," Springfield Central coach Darryl Denson said. "Because this is a bitter taste to leave in some kids' mouth. The kind of coach I am, I take it personal, and my kids feed off of me, so we're gonna come back with a different attitude." The Panthers now move on to the Division 1 state championship game, where they will face defending champion Cambridge R&L. Tip is scheduled for 5:45 pm at Springfield's MassMutual Center.